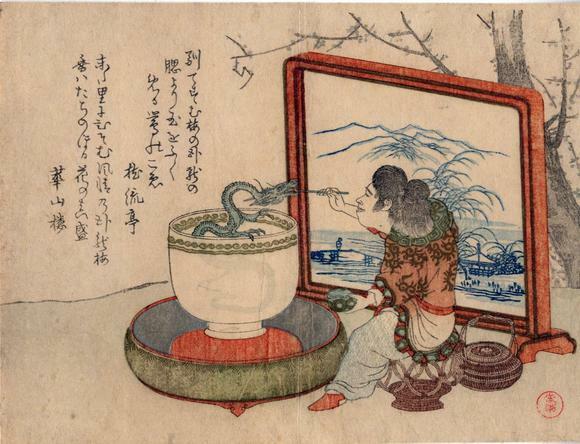 Koban surimono - Boy feeds a small dragon kept in a large porcelain cup. Notice that the cup is somewhat translucent and that the lower part of the dragon can be seen through its outer surface. There is liberal use of metallic inks and embossing. Two poems by Bairyūtei and Kanzanrō. Both poems refer to the Garyōume, the old plum tree growing at Komeido Shrine..."
Quoted from: Surimono in the Rijksmuseum, Amsterdam by Matthi Forrer, p. 55.